The Prem Rawat Foundation (TPRF) strives to address fundamental human needs so that people everywhere can live their lives with dignity, peace, and prosperity. 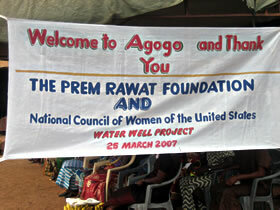 Founded in 2001, TPRF works to extend the outreach of Prem Rawat’s message of peace throughout the world. TPRF also provides aid for people in urgent need of life-sustaining resources like food and water, especially in areas where funds from larger foundations may not be available. The Foundation has actively funded humanitarian initiatives in 27 countries. An important part of the TPRF's mission is to help improve the quality of life for people most in need. The Foundation regularly holds free medical clinics in India, helps refugees in war-torn areas, and assists other organizations that support charitable, social, or philanthropic programs and services consistent with Prem Rawat's message of peace. The Foundation has delivered aid rapidly and efficiently in many countries to people whose lives had been devastated by natural disasters. TPRF has relationships with the best humanitarian organizations with a strong presence in the field: Friends of the World Food Program, the Red Cross, the Houston Food Bank, Action Against Hunger, and Oxfam, among others. The activities of TPRF are funded by the generosity of individuals who are appreciative of Prem Rawat’s message and the Foundation’s humanitarian initiatives and by the sale of related materials. The promotion and dissemination of Prem Rawat's message is funded by the contributions of people who appreciate his message and wish to help make it available to others. Prem Rawat is a successful private investor and does not receive any compensation from the Foundation or any other organization furthering his message. These partnerships are very successful. Foundation’s relationship with Friends of the World Food Program has enabled them to provide food for one month to 9,000 Indonesian tsunami victims; 2,000 famine victims in Niger; 4,500 school children in Guatemala; 6,000 earthquake victims in Pakistan; and thousands of earthquake victims in Peru. Through the Red Cross, the Foundation provided food aid to mudslide victims in the Philippines, and through Oxfam, TPRF helped to provide drinking water to war victims in Lebanon and Israel. Through the Houston Food Bank, TPRF provided three meals a day for three months to 8,000 victims of Hurricane Katrina. "Food for People" initiative was started by Maharaji which provides nutritious meals twice a day round the year to people in need in India, Nepal and few other countries. The Foundation also regularly holds free medical clinics. Volunteer eye-care professionals come at appointed times about once a year in each location. They examine people's eyes and dispense the most commonly needed prescriptions immediately. Special prescriptions are made up overnight as needed. At each clinic, about 2,000 people are examined, with 75% of them needing glasses. While blindness is widespread in India, most of it is preventable, and TPRF is educating people on how to take care of their eyes as well as treating their eyes with simple medications and corrective lenses. Irene Woodhead and a team of volunteers launched the Peace Education Program in Cornwall, UK with a screening of “Inside Peace,” a documentary about four inmates who attended the peace workshops in a Texas prison. One viewer said it was “absolute madness that there are inmates who have a life of pain and difficulty who are in more peace than billions of people on the outside world, living normal ‘free’ lives… It was just amazing to me— if these guys get in contact with that, then anyone can." The post “Inside Peace” Screening Leads to Peace Education in Cornwall, UK appeared first on TPRF.org. The Everglades Endeavor is a newspaper that is published by the Everglades Correctional Institution (ECI) and distributed to inmates in Miami, Florida. The post Everglades Endeavor: Inmates Report on Peace Education Program appeared first on TPRF.org. The National Lottery Community Fund awarded a grant of £10,000 to expand The Prem Rawat Foundation’s Peace Education Program in the UK. The post National Lottery Funding Awarded to Support Peace Education Program in UK appeared first on TPRF.org. The post Witnessing Transformation Behind Walls at Miami Prison appeared first on TPRF.org. Over the last year, the Peace Education Program (PEP) has received a very good reception in Spain, marked by collaboration agreements that build off of the one signed in early 2018 by the Malaga Centre Education, Culture and Peace, Club Malaga for UNESCO. The post Malaga UNESCO Club Promotes Peace Education Program in Spain appeared first on TPRF.org. Thanks to the efforts of enthusiastic siblings, the Peace Education Program (PEP) has been integrated into a college in Jacqueville, Côte d'Ivoire, giving students a sense of inner strength and hope as their country heals from social unrest. The post Peace Education Gains Popularity at Côte d’Ivoire College appeared first on TPRF.org. The Food for People program is transforming disadvantaged communities by feeding children, improving health, growing school enrollment and boosting local economies. The post Prem Rawat Foundation Tops 2.3 Million Meals Served to Malnourished Children appeared first on TPRF.org. Guidestar and Charity Navigator recognize The Prem Rawat Foundation for outstanding transparency, fiscal responsibility and humanitarian programs. The post Prem Rawat Foundation Earns Top Ratings From Independent Charity Evaluators appeared first on TPRF.org. These new videos were recently released to show some of the ways that people make a remarkable impact when they support TPRF to engage in change. The post Videos: See How TPRF Engages in Change appeared first on TPRF.org. The post TPRF is Hiring a Program Manager for the Peace Education Program appeared first on TPRF.org.